So today Mageweek starts. Well... I don´t really know that much about mages. Had a Goblin mage once, but I died a lot with her so she wasn´t fun anymore. A few days ago I started a new mage not thinking that mage week was this close. And the race of this mage is.. Well you guessed right. Goblin. I just couldn´t keep myself from doing it. They look so cute and tiny... Wait... Thats Gnomes.. Not Goblins.. Oh well. My mage is at the moment really small (yeah I said it). She hasn´t left her starting area.. Or well... She´s on the second isle. This weeks goal is (if I have the time as 5.4 comes this week) she´ll be at least level 15. Didn´t do any dungeons with my first mage so this time I will. Not sure which spec she will have. Fire is sounding good, but I´ve heard that the best spec is Arcane. What do you think? Well time to introduce my mage. 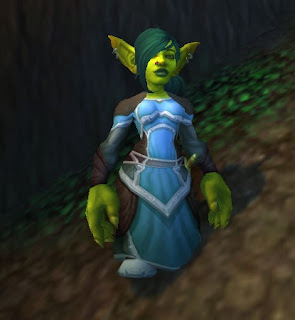 Her name is Wecctra as my Goblin Shaman was named (She doesn´t exist anymore or that name wouldn´t work on the server)..
Ah. There I found it. She´s level 7 at the moment so 8 levels to go. So this week will be about her and her journey. Hopefully I´ll post a second post before bed about her and that She has come to Orgrimmar. Oh.. And which spec that will be her first. She's cute. I always think small is best with Mages especially if you're going to Pvp (and even if you aren't). Personally I think fire is more fun than arcane. Mostly because blowing stuff up is awesome not because of any scientific reason backed up with theory-crafting. Thanks :) Not sure yet if I´ll try out PvP with her. I´m a bit scared of PvP.